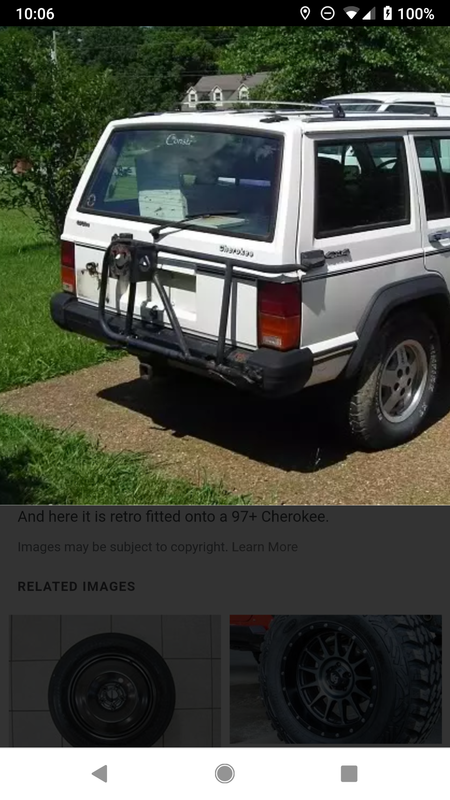 Does anyone know where I can find one, buy or if some knows if there is someone remanufacturing these or carriers for the Cherokees. I really want to get a smittybuilt bumper that has a carrier and 2inch reciever built-in. But very expensive and heavy. O and it really looks cool.... Just can't afford it right now. If I can find the oem carrier, then I can get the tier out of the back of my Jeep ...I just hate though that I have to bolt that bracket to the side of the jeep. Only bad thing..... anyway. Does anyone know where I can find one? Thanks, have u seen many people use bronco carriers on Jeep's? There a lot more of those around then Jeep's. Project *insert clever title* is a go!